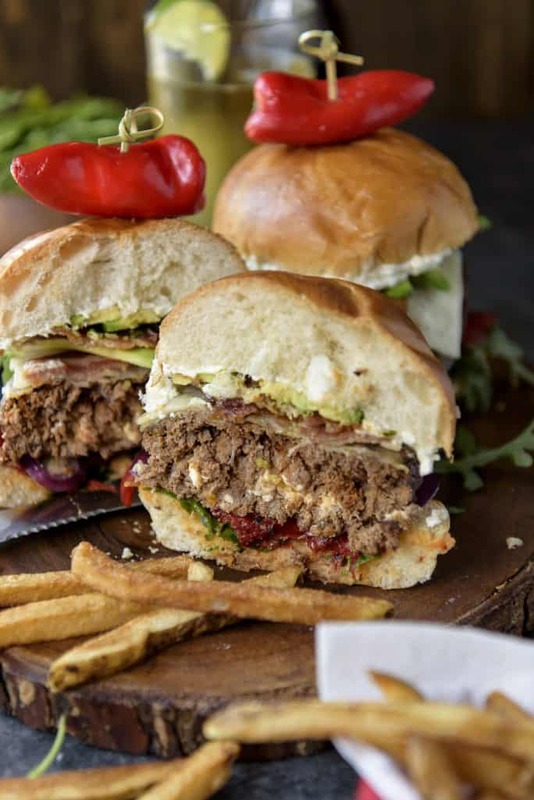 This almost-Mediterranean Bettah Feta Burger recipe isn’t just a cutesy name – it’s your new favorite burger! Stuffed with crumbled feta cheese, these babies are then topped with peppery arugula, juicy roasted red peppers, crispy bacon, and even more creamy whipped feta for a crazy flavor explosion! 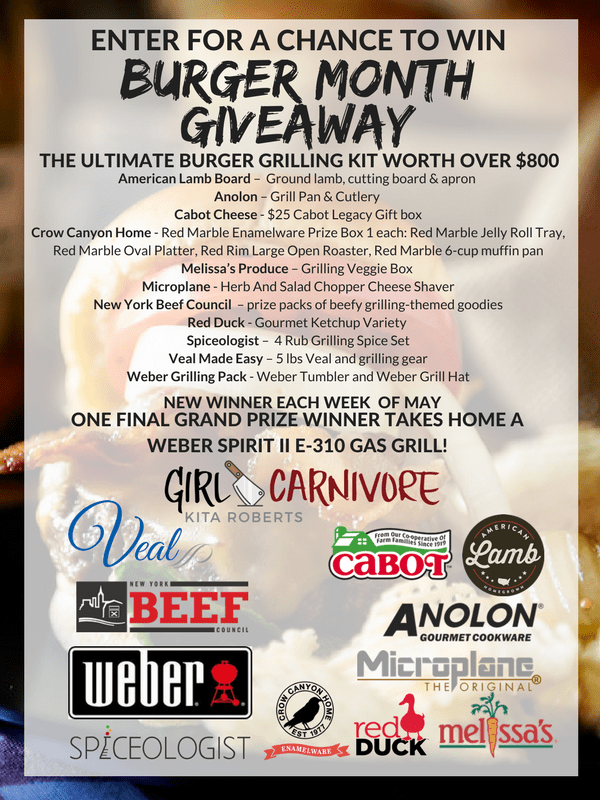 This post is presented in conjunction with the #BurgerMonth grill giveaway, hosted by GirlCarnivore. All opinions stated (the burger epicness) are my own. Thank you for supporting the brands that make this blog possible! This burger give me so many feels…both good and bad. I love a good burger and always have, but last time I had a really greasy, delicious one (not gonna name names, but Crimson Scherbatsky…) I found out I have an ulcer. The hard way. Like the walking-around-Kohl’s-with-my-husband-and-suddenly-dropping-to-the-floor-Indian-style-among-the-ties-in-pain hard way. After 4 days of misery, self-diagnosis, and a doctor’s visit, I had to put myself on a no-bad-food diet. So yeah. Let’s chat good and bad about burgers. The Good: Bison. This burger here is made with lean buffalo meat, which is surprisingly delicious and very similar to beef. Bottom line: it’s a healthier burger choice, but you can’t really tell. The Bad: Because it’s so much leaner than beef, the burgers are slightly less juicy than normal. If you’re not worried about your gut health or cholesterol, stick with ground beef or hamburger meat. Burgers need than grease to really rock. The Good: Burger Month! My friend Kita at GirlCarnivore hosts this meat-stravaganza annually. You can count on it always being a fun time, full of so many different, delicious recipes. Plus, the giveaways ROCK. Take a peek at what’s up for grab’s this year below, then keep scrolling to enter! The Bad: Burger Month is only a month long! We should celebrate these amazing creations all year long, right??! The Good: Three types of cheese! Well, two, with two incarnations of the same one. Crumbed feta, whipped feta, and Havarti (just for the meltttttt). Never too much cheese. The Bad: Skyscraper height. I piled these things so high, they were kind of hard to eat. I mean, we made do, but there were some hairy moments where the dog thought he was getting an extra special treat for dinner. The Good: Toppings! 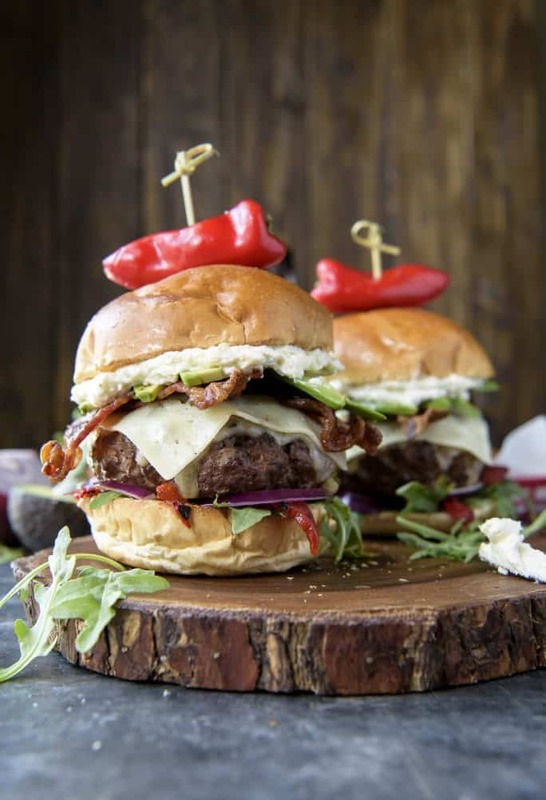 This Feta Burger is slightly Mediterranean in nature, with the feta, roasted red peppers, and smoked paprika in the meat. Adding some peppery arugula, raw red onion, avocado, and crispy bacon brings in extra textures and flavors that go surprisingly well together. Try not to muck the flavors in this feta burger recipe up with mayo or ketchup. I habitually use both on my burgers, but those marinated red peppers and whipped feta should compensate for them both. If you’re not a fan of arugula, sub in some spinach for even more Mediterranean burger flair. Want some extra crunch? Cucumber slices instead of avocado! You lose out of some Omega-3s, but that mild flavor might be worth the swap. As with all of my recipes, these feta burgers are obviously open to interpretation and adaptation. Make smaller burgers if you want to. Use what you have for toppings. Put it all on brioche or potato buns. But whatever you do, don’t skip the whipped feta. It’s irreplaceable. This is called The Bettah Feta Burger for a reason! Five Tips for the Perfect Feta Burger! 1. Choose beef with an 80/20 fat ratio. This will ensure a juicy burger that’s not too greasy but not too dry inside. 2. Don’t overwork the meat. When mixing in your seasoning, don’t knead the beef too much or you’ll end up with a tough burger. 3. Make your patties bigger than your buns. Burgers shrink while they cook as the grease and liquid oozes from them, and there’s nothing worse than too much bun. 4. Salt your patties generously just before grilling. Feel free to season your meat before making patties, but save the salt for the outside. Salt extracts moisture, and will cause your burgers to tighten up and be tougher than they should be when you eat them. 5. Let the meat rest. Just like with steaks and pork tenderloin, letting your burgers rest for about 5 minutes after cooking allows any external juices to ooze back into the meat while it finishes cooking off the heat. 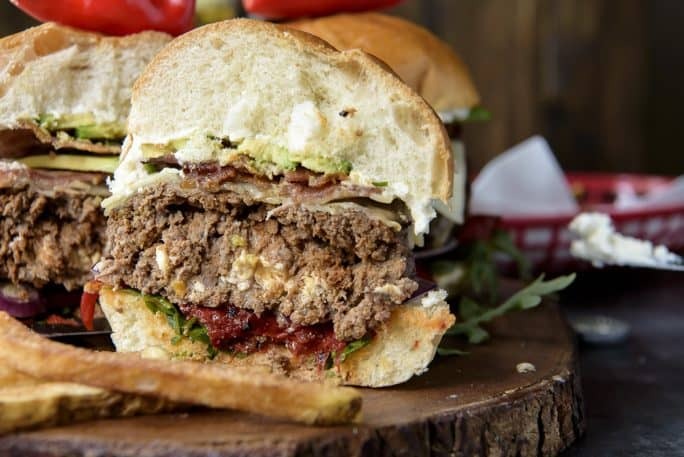 This almost-Mediterranean Bettah Feta Burger recipe isn't just a cutesy name - it's your new favorite burger! 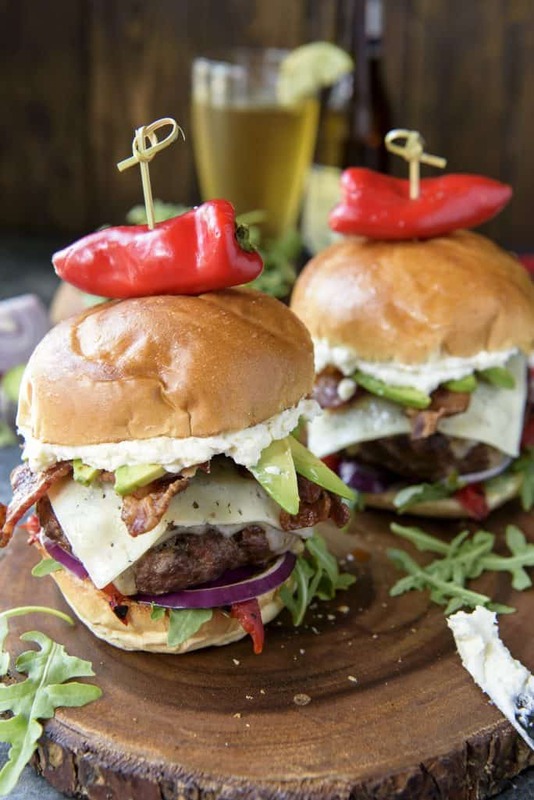 Stuffed with crumbled feta cheese, these babies are then topped with peppery arugula, juicy roasted red peppers, crispy bacon, and even more creamy whipped feta for a crazy flavor explosion! Preheat an outdoor grill on medium heat, and lightly spray the grate with cooking oil. Combine the ground buffalo/beef, Worcestershire, and seasonings in a medium bowl. Knead together with your hands until well combined, then form the mixture into 8 equally-sized balls. Flatten them to make thin patties. Divide the feta cheese between four patties, then top each with a second patty. Press the edges together to seal the cheese inside, then smooth out the sides with the palms of your hands. Sprinkle generously with salt. Cook on the grill until the burgers are cooked to your desired doneness, 4-5 minutes per side for medium. Aim for between 145 and 160 degrees F. Remove from the grill and top with Havarti cheese, allowing it to melt from the residual heat. Let the burgers rest 4-5 minutes while you prep your toppings. Place buns, cut side down, on grill and toast about 1 minute. Load up the burgers! Layer arugula, red pepper, and red onion on the bottom on the hamburger bun. 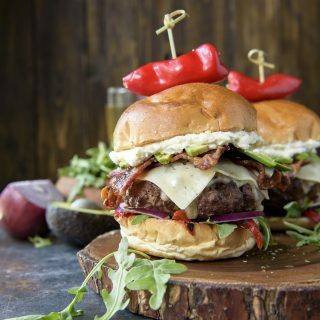 Top with the burger, bacon, and avocado. 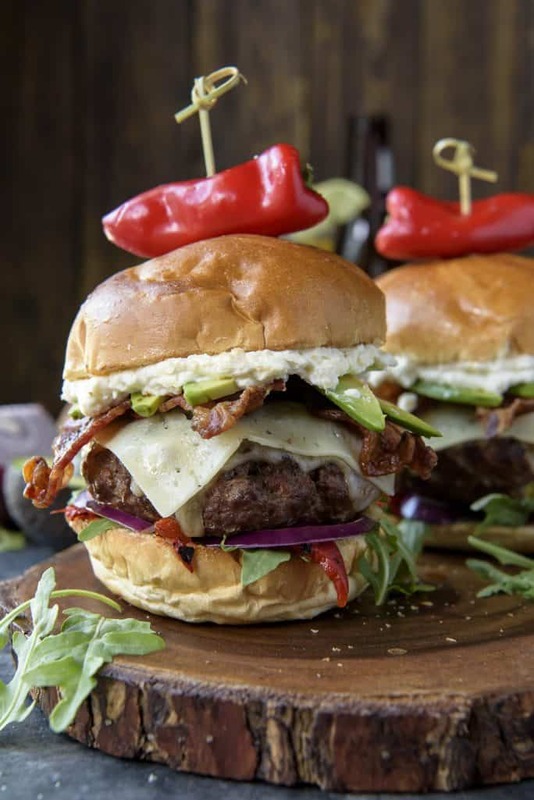 Spread some whipped feta on the cut side of the top buns, then place it on top of the burgers. Skewer with a toothpick or cocktail stick & serve. Add crumbled feta to a food processor and pulse until small crumbs remain. Add cream cheese and puree for 4-5 minutes until creamy, scraping down the sides as necessary. Refrigerate any leftovers. 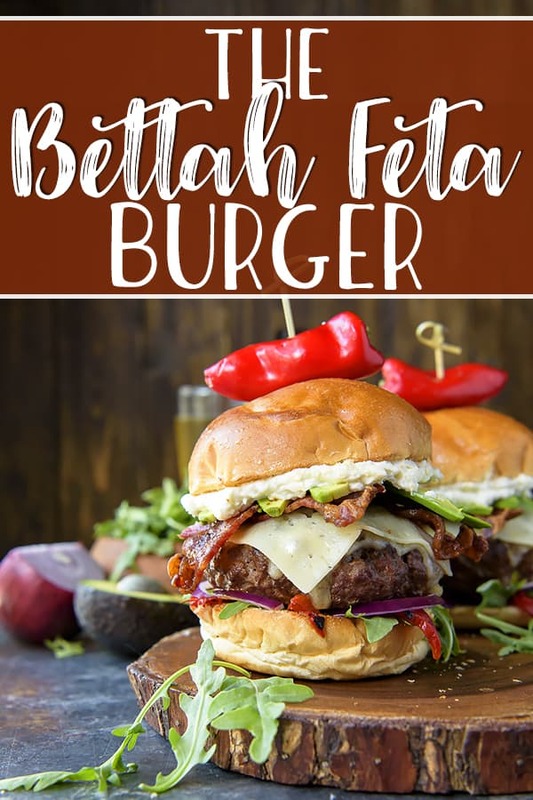 PIN THIS BETTAH FETA BURGER RECIPE FOR LATER! 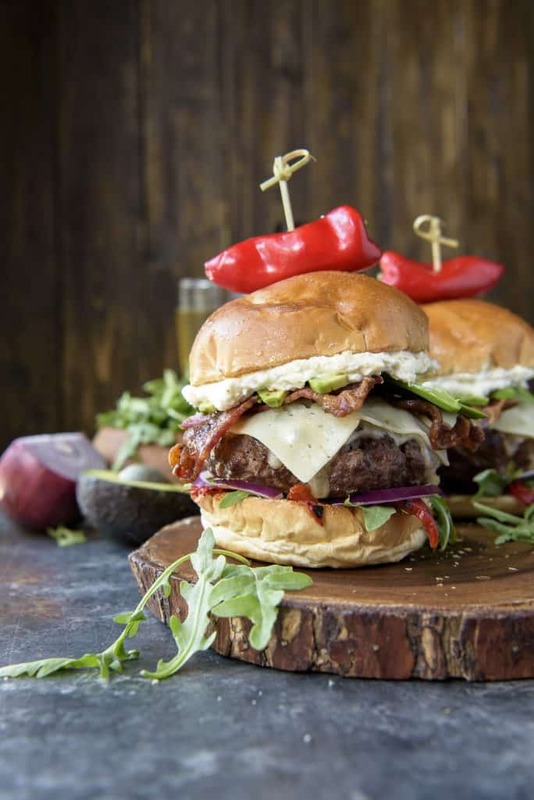 A huge thanks to the #BurgerMonth sponsors American Lamb Board, Anolon, Cabot Cheese, Crow Canyon Home, Melissa’s Produce, Microplane, New York Beef Council, Red Duck, Spiceologist, Veal Made Easy, and Weber Grills. I love the cheese bi-fecta in this burger! The more cheese the bettah! You can tell from the pics that the good way outweighs the bad with these burgers. Holy wow those burgers are looking insanely good. Awesome job! Just made my day ! Thank you !